Do the desert flowers have you dreaming of more scientific exploration? Here's your chance. Do the desert flowers have you dreaming of more exploration? Here's your chance to delve deeper into the natural side of this extraordinary destination. 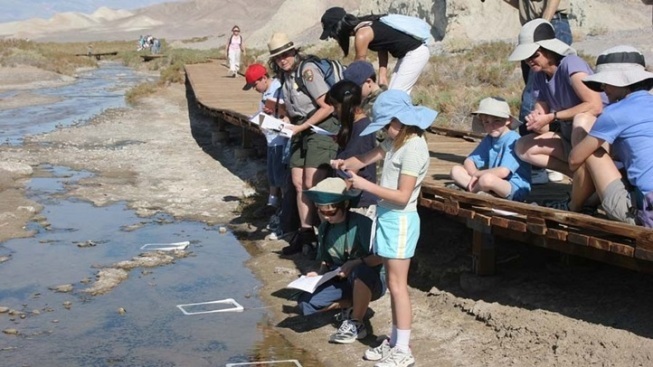 BIOBLITZ AT SALT CREEK, a day devoted to "the biodiversity of the Death Valley area." It's an event that helps "the public to interact connect with the scientific community" on the matters of what grows and thrives and flows and persists in this very low, very hot, and very dry location. Plenty does, of course, and not just the once-in-a-decade wildflowers (though they do have a wonderful knack for making headlines around the world). Members of the public will help scientists catalog and study nature in the valley, so call it an outing of extra engagement. The topic list for the day is flat-out neat, especially if you've always been the sort of person who'd kneel down upon a sidewalk to get a closer look at an inchworm or autumn leaf. THE BIOBLITZ WILL INCLUDE... looks at mammals, salt, aquatic ecology, pupfish, evening bugs, bat detecting, conservation, and a host of other dig-down-deep subject matters. And, for sure, flora is on the list, if the recent super bloom has you wanting to know a lot more. Know this, though: Making your plans to attend means finding a room in the area -- Furnace Creek and its inn and ranch are nearby -- and planning to catch a shuttle to Salt Creek from the Furnace Creek Day Use Area. BioBlitzers, are you ready to get your science on in the phenomenon we know and love as Death Valley? Grab your notepad and pencil and do your research here. IS THIS HAPPENING ELSEWHERE? Many parks across the nation are undertaking similar studies, and inviting the public to participate. The National Park Service has more on this nifty, nature-helping, science-cool spectacular.